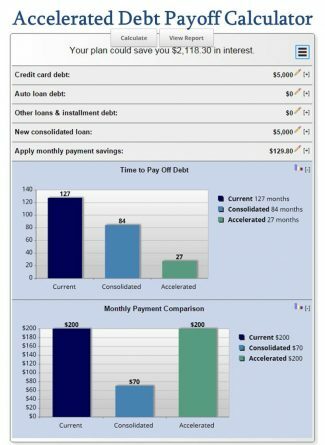 Accelerated Debt Payoff Calculator can be used with or without debt consolidation - but is ideally used in-conjunction with debt consolidation. Debt consolidation is a helpful first step - this Accelerated Debt Payoff Calculator can show you how to accelerate your debt payoff by creating a plan for paying off debt in full. The process is simple; just apply a portion of your consolidated loan's monthly payment savings to the consolidated loan's balance. You can save hundreds, even thousands in interest and pay off debt years sooner! Click on View Report to see the detailed Amortization Schedule with Extra Payments and graphs featuring: Time to Pay Off Debt and Monthly Payment Comparisons. You may also email the results by clicking on the three-line icon in the upper right hand corner of the mortgage calculator. Looking for a different calculator? More Calculators Here.